level position gave the signalman a clear view of the track on the west side of the bridge. 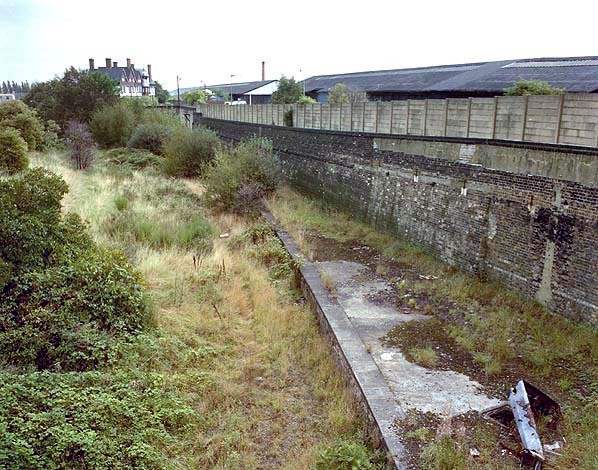 There was a footbridge at the east end of the station, this appears to have been removed in the early years of the 20th century. Although the booking office was at street level there is also some evidence that there was a ticket booth at platform level as well as some tickets are known with the words 'Lower Office'. Both platforms had a timber canopy, that on the up platform was at the bottom of the stairs and suspended from the retaining wall. On the down platform there was a free standing timber structure some distance to the east if the stairs. The length of the branch once open to passenger traffic was 1 mile, 61 chains, from a point 34 chains east of Custom House Station. The first part of the line from Albert Dock Junction to Central was opened on the 3rd August 1880. The line between Connaught Road and Central was single but was doubled on 14th November 1881.
yards further east with Great Eastern trains occupying the north side (platform 1), and the dock company's trains, on the local service, kept to the south side (platform 2). A few weeks later a new station replaced the old one at Manor Way. 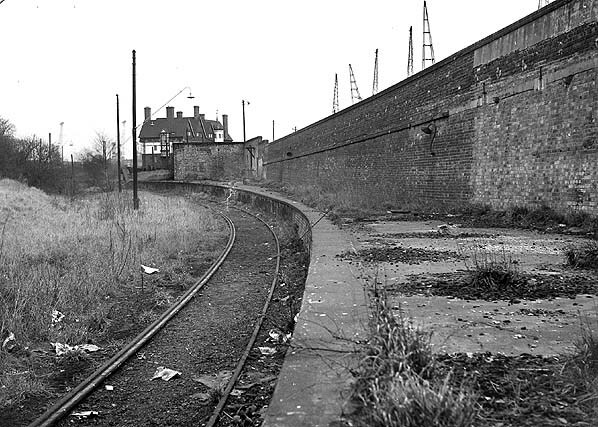 The line continued beyond the station at Gallions to a coal wharf and jetty at Gallions Reach. Stratford Market. The local service of seventy trains in both directions made up the remainder, bringing the total to 107 journeys. In general, trains called at all three intermediate stations but there were some exceptions. except at Gallions where it was still in situ until at least 1974. With the lifting of the track to the east, Gallions was later reached via a connection from freight lines to the south. Tickets from J E Connor except 7242 Michael Stewart. Tickets for the four stations on the Gallions branch are sometimes shown as Royal Albert Dock with a letter to indicate which station. A was Gallions, B was Manor Way, D was Central and E was Connaught Road. 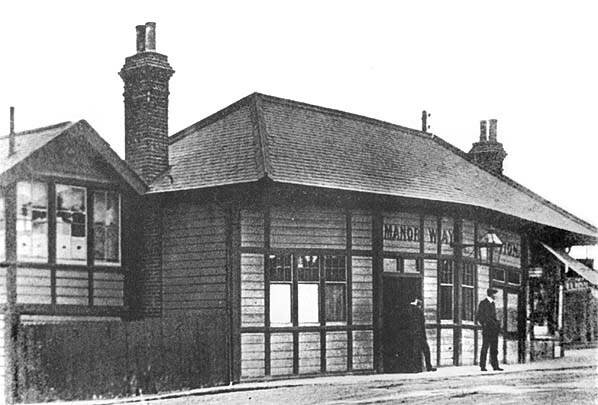 Manor Way station - the 1887 street level entrance seen in 1908; note the signal box on the left, this was removed in 1926 when the road was widened. This unusual position allowed the signalman a clear view of the track on the opposite side of the bridge. At this time the booking office was replaced by a longer building. 1919 1:2,500 SO map. 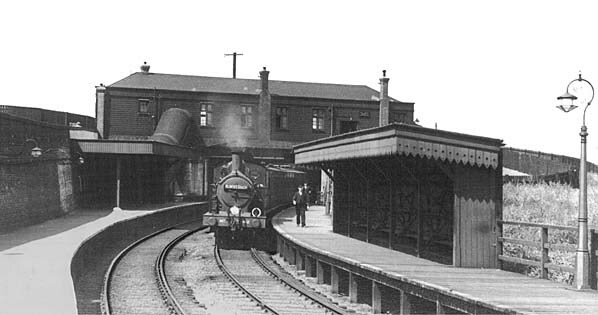 The signal; box is still shown but the footbridge had gone by this date. 1958 1:2,500 SO map. This map shows the station 18 years after closure. The line has now been singles and the down platform has been demolished. Manor Way station in 1939 looking west after the arrival of a Fenchurch Street to Gallions train hauled by an ex-GER 2-4-2T. The headboard says 'Albert Dock' which means stations within the dock:' Gallions, Manor Way, Central and Connaught Road. Manor Way station looking east towards Gallions c. 1930s. 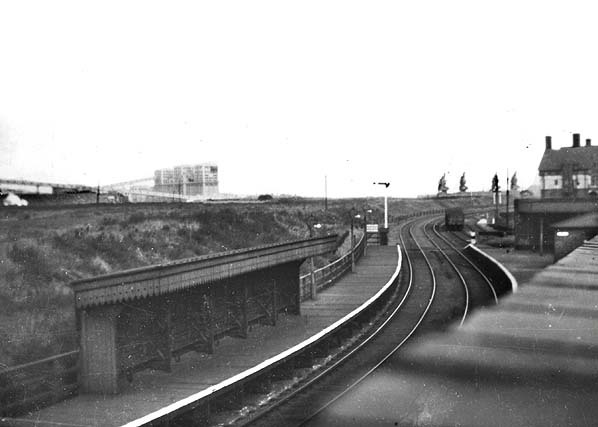 The timber down platform seen on the left was quickly demolished after closure in 1940. Manor Way station looking east in the mid 1960s. After closure of the line in 1940 the line was officially abandoned by the PLA Act of 1950. After that date it was was retained for wagon storage but had been singled by the mid-1950s. The track was lifted shortly after this photograph was taken. The Gallions Hotel (still standing) is seen in the background. 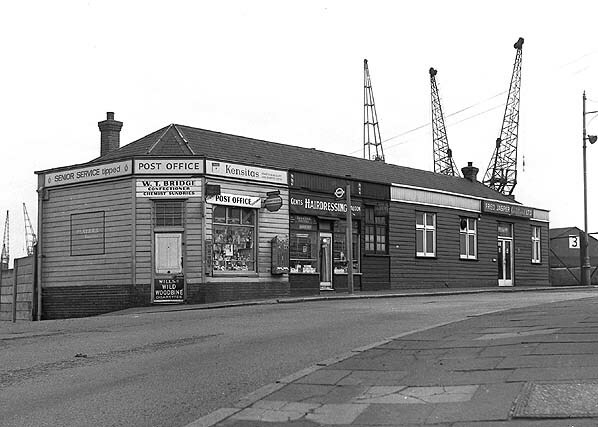 This was the site of the original Gallions terminus. 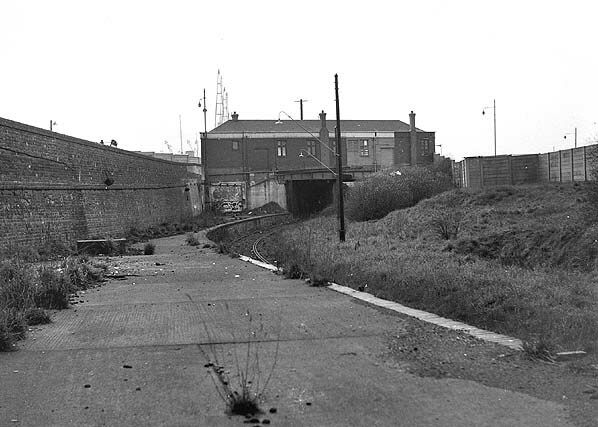 Manor Way station looking west in the mid 1960s. 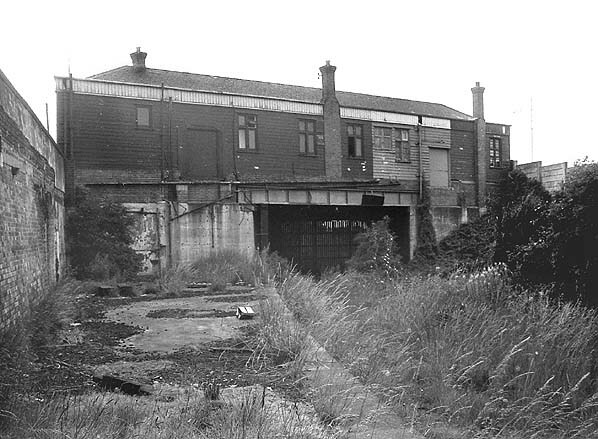 The down platform was demolished soon after closure in 1940. In the mid 1960s the street level building was still in good condition and was divided into three commercial premises; a Post Office, a gents' hairdresser and a turf accountant. 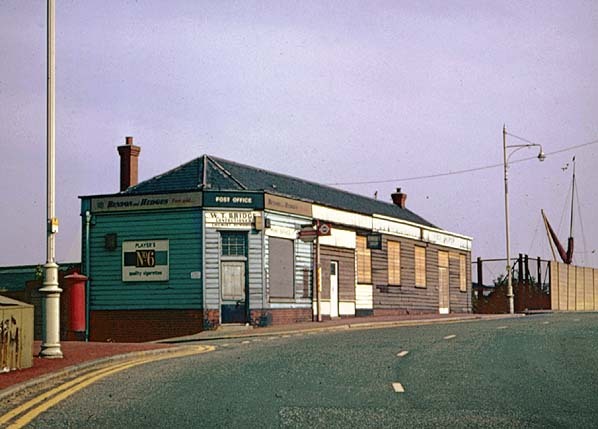 In 1972 the street level building was no longer in use and boarded up. 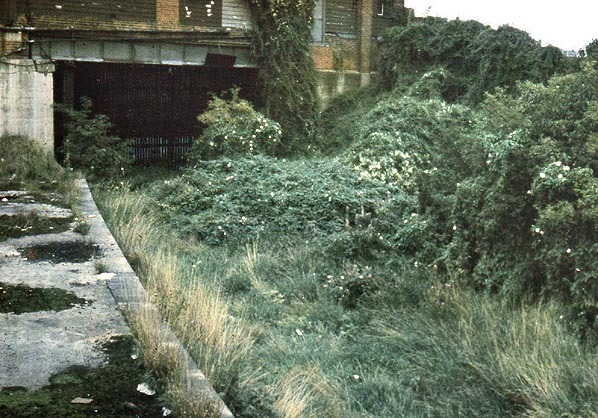 Manor Way station looking west in 1975. The street level building survived until 1979. Manor Way station looking east in September 1980. 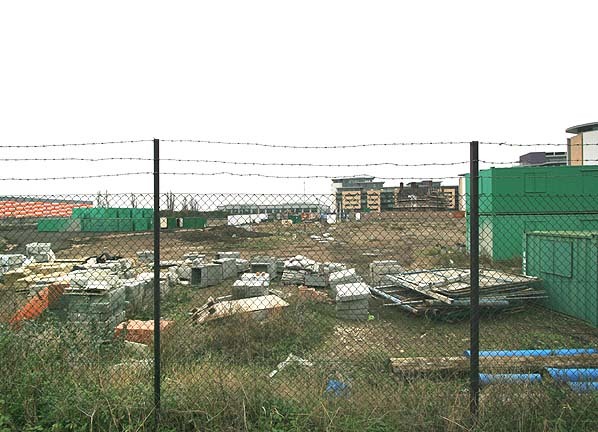 Site of Manor way Station looking east in December 2006. The Gallions Hotel links this view with the earlier pictures; It can be seen surrounded by scaffolding between the two blocks in the background.